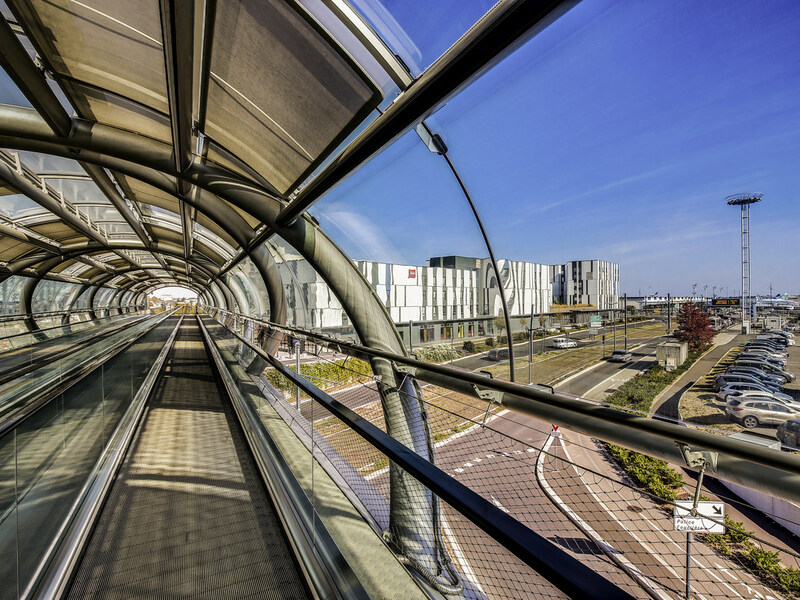 A stone's throw from the airport, making it the ideal place to stay before an early-morning flight, the ibis Paris Coeur d'Orly Airport hotel is located close to the capital's major tourist sites, and less than 60 minutes' drive from the Palace of Versailles and Disneyland Paris. Our hotel is located less than 45 minutes from the Stade de France and Parc des Princes stadiums, ideal for guests attending sports matches or concerts. The hotel in itself is good. Rooms are bigger than in most Ibis, well sound proofed. Everything you need in one place at a moderate price. But it can be difficult to find, as it is not sign posted in the airport. Best to go to terminal 3 using the free automated shuttle OlyVal, then walk. There is a big modern walkway bridge from terminal 3 that ends next to the hotel. Avoid the shuttle bus, it will drop you at some distance to the hotel, it is as quick to walk. Unable to sleep on both nights. Pillows uncomfortable, rooms far too warm, bathrooms so small almost unusable. Second nights stay the room only had one bedside lamp & no second bedside table. Not good for two people. Food just about edible. Good short stay. Room clean and quite, perfect if you fly out of Orly. Well connected to the city. The hotel is very close to the airport. it is very comfortable. the staff were nice and the answer my questions. i think it is a good hotel. the room was a little bit small but it is ok when you arrived from abroad and if it is for one night. Reception was professional and speedy despite the late hour. Our room was small but functional and remarkably quiet considering it is on the airport. We came back down to the bar to wind down after a fraught journey from Terminal 1 where we were directed to a bus which took us into Rochereau not to terminal 4 and where we had to taxi back. There was no information desk at the airport so we took the advice of the guy at the taxi rank - wrong! As we were arriving late it would have helped to know how to get to the hotel from terminal 1 at 11p.m. We had 1 drink and went to order another and some food to find that the bar had shut - no warning, just shut although there were several people in the bar. We were under the impression that both food and drink were available 24 hours. Our flight the next day was from T4 and the hotel was brilliant for that. We will still use Ibis again as the hotels are always well situated and great value so it was a great end to an enormously frustrating start much of which was nothing to do with Ibis!!! I knew the rooms are small, but it is enough for a one night stay between two flights. I spent there one night because I had an early flight. I've called the hotel lot of times because I needed an information, they didn't reply, I had to sent an e-mail and just after hours I had a response. When I arrived the receptionist weren't nice (they didn't even welcome us), they gave me a room that smelled cigarette (they chanced it when I told them). However, I usually choose IBIS beacause I expect to have the same service everywhere and I didn't had it in this hotel. I think I would never book again an IBIS after this experience, the only good thing is the location, but, in my opinion it doesn't mean that they can act without professionality. Uncomfortable and disappointing rooms, look nothing like the photos on line and overpriced. Very good reception by a very prepared and educated gentleman. Room was ok, corresponding to the price. Restaurant food was disappointing but &quot;edible&quot;. I didn't hear noises in the night and slept well. Gentleman at the reception, at the time of the check-out, was not very polite, without a &quot;good morning&quot;, or &quot;see you next time&quot; whatsoever. I prefered to think he was a disabled-person with a speaking disorder.